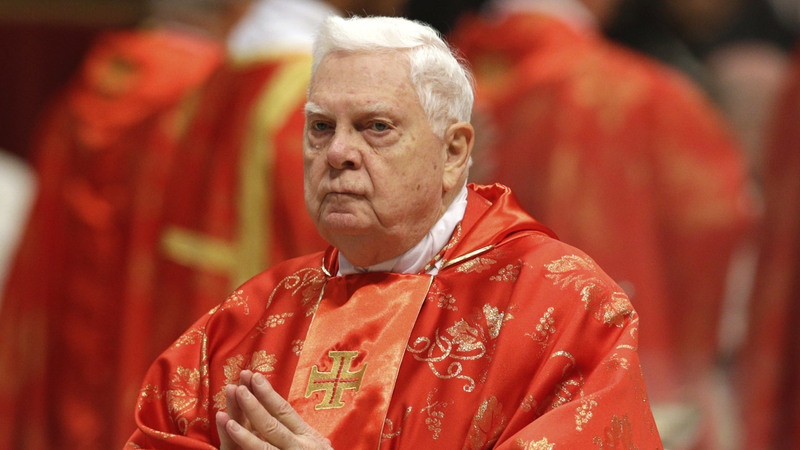 BOSTON -- Cardinal Bernard Law, the disgraced former archbishop of Boston whose failures to stop child molesters in the priesthood sparked what would become the worst crisis in American Catholicism, died early Wednesday, the Vatican said. He was 86. But in January 2002, The Boston Globe began a series of reports that used church records to reveal that Law had transferred abusive clergy among parish assignments for years without alerting parents or police. Within months, Catholics around the country demanded to know whether their bishops had done the same, a scandal that was recounted in detail by the Oscar-winning film "Spotlight." "It is my fervent prayer that this action may help the archdiocese of Boston to experience the healing, reconciliation and unity which are so desperately needed," Law said when he stepped down as head of the Boston archdiocese in December 2002. "To all those who have suffered from my shortcomings and mistakes, I both apologize and from them beg forgiveness." It was a stunning fall from grace for Law and a rare step for the church, which deeply resists public pressure but could no longer hold out given the scope of the crisis. Since 1950, more than 6,500, or about 6 percent of U.S. priests, have been accused of molesting children, and the American church has paid more than $3 billion in settlements to victims, according to studies commissioned by the U.S. bishops and media reports. As the leader of the archdiocese at the epicenter of the scandal, Law remained throughout his life, and now in death, a symbol of the church's widespread failures to protect children. Still, Law retained some support in the Vatican. In 2004, he was appointed archpriest of the Basilica of St. Mary Major, one of four principal basilicas in Rome. When John Paul died the next year, Law was among bishops who presided at a memorial Mass for the pontiff in St. Peter's Basilica. Law also continued for several years to serve in Vatican dicasteries, or policy-making committees, including the Congregation for Bishops, which recommends appointments to the pope. Advocates for victims saw the posts as a tone-deaf sign of favor for Law by church officials unrepentant about abused children. Law's successor as archbishop, Cardinal Sean O'Malley, said it was a "sad reality" that Law's legacy will forever be tied to the abuse scandal since he led the Boston archdiocese at a time "when the church seriously failed" in its job to care for its flock and protect children. "I offer my sincere apologies for the harm they suffered, my continued prayers and my promise that the archdiocese will support them in their effort to achieve healing," O'Malley said in a statement. Francis, who met with Law briefly the day after he was elected pope when he went to pray at St. Mary Major, made no comment about Law's passing during his weekly general audience Wednesday. Francis though was expected to send an official telegram of condolence later in the day and celebrate Law's funeral Mass, an honor accorded to all Rome-based cardinals. SNAP, the main U.S. advocacy group for survivors of abuse, urged Francis to keep survivors in mind during the funeral, saying Law didn't deserve the pomp and circumstance he enjoyed in life and shouldn't have it in death. "This celebratory focus on abuse enablers like Law must end," said SNAP's Joelle Casteix. "It is time for the Vatican to refocus on change: protecting children and those who have been hurt." Law was expected to be buried in Rome, O'Malley said. The location hasn't been disclosed, but Law would be entitled to be buried at St. Mary Major.